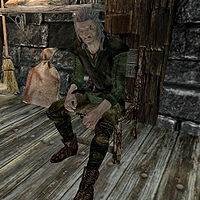 Sifnar Ironkettle is an elderly servant found in Windhelm in the Palace of the Kings. He wakes up at 8am and spends the day down in the lower area of the palace before heading off to bed upstairs at midnight. Sifnar wears a set of farm clothes along with some boots. He carries an iron dagger, along with a selection of lower-class items and gold. He does not have much to say about himself and he doesn't seem to mind telling you this when he remarks, "I do the cookin' and cleanin' round the palace." and "Don't need to pay me no mind. I'm the least important person in here." He also admits that his job isn't particularly easy or rewarding when he says, "Keepin' the palace clean an' the lords fed ain't easy work, but it's honest work." Sifnar is a member of the warrior class, which determines the level of his skills. This page was last modified on 1 May 2015, at 15:31.